Donkor had moved to London to study art at Goldsmiths. He chose to use his harrowing experience to inspire a disturbing self-portrait Helping with Enquiries 1984, 2005 – in which he is naked and being attacked by a policeman. 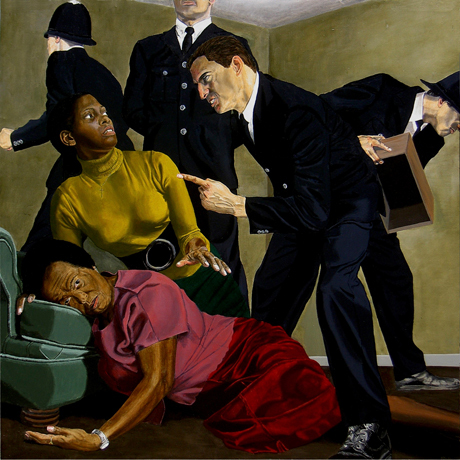 In his painting Johnny Was Borne Aloft By Joy And Stephen, 2010, Donkor has depicted Jean Charles de Menezes being carried to heaven by Stephen Lawrence and Joy Gardner. In this painting When Shall We 3? (Scenes from the life of Njinga Mbandi), 2010, Njinga Mbandi, a 17th Century southern African princess is sitting down opposite a white, male European governor. Instead of sitting on a chair like he does, she sits on the back of a white woman.